Dr. Morando Soffritti of the European Ramazzini Foundation will present the results of a new study confirming the carcinogenicity of Aspartame on April 23, 2007 at the Mount Sinai Medical School of New York, where he also will receive the prestigious Irving J. Selikoff Award. Aspartame, the artificial sweetener made by Searle/Monsanto was found to cause cancer in laboratory animals already in the original studies that were submitted to the FDA when approval was asked to put it on the market. The justified doubts of the FDA's scientists were overridden when Donald Rumsfeld called in his political markers. Another study conducted in Spain by Trocho et al came to similar results, identifying a transformation of parts of the molecule into formaldehyde as a probable cause. Later, a study of the European Ramazzini Foundation confirmed the sweetener's carcinogenicity in laboratory rats and seriously questioned its safety. But industry, through the European Food Safety Authority, succeeded in diverting attention from the damaging findings, calling them an artifact of the study's design. A second study conducted by the European Ramazzini Foundation (ERF) confirms the carcinogenicity of aspartame. The results of this study will be presented April 23, 2007 at the Mount Sinai Medical School of New York, where ERF Scientific Director Morando Soffritti will receive the third Irving J. Selikoff Award. The FDA has long known of the damaging nature of the sweetener. At one time, it published a list of 92 diverse side effects and in part serious reactions to consumption of the stuff. As many may know, aspartame is on the market illegally. It's adulterated as discussed by the National Soft Drink Assn (now American Beverage) and in the congressional record. http://www.wnho.net/congressionalrecord.htm Because you cannot ship an adulterated product for sale it, therefore, violates Interstate Commerce. Dr. Adrian Gross, FDA toxicologist, told Congress that aspartame violated the Delaney Amendment which forbids putting anything in food that caused cancer in animals. www.wnho.net/whopper.htm It's also a drug, an addictive excitoneurotoxic carcinogenic drug that interacts with all drugs and vaccines, and is masquerading as an additive. Here is the Board of Inquiry Report of the FDA revoking the petition for approval of aspartame, after it kept it off the market many years and they attempted to have the manufacturer, Searle, indicted for fraud. http://www.wnho.net/fda_petition1.doc Note in the commentary above it is a clip from Sweet Misery: A Poisoned World, www.amazon.com, James Turner, Washington, D.C., attorney explains how Donald Rumsfeld who was then CEO of Searle called in his markers and got aspartame, this deadly poison, on the market for human consumption. Several people have asked for this list so they could forward it to the media when the manufacturers, front groups and professional organizations funded by the manufacturers put propaganda in the press. Even the FDA has lied about the existence of this report. I do have it on FDA stationery which I have faxed to the press many times when they tried to deny it. This report was gotten through Freedom of Information. If you do forward this to the press be sure you always include the Diane Fleming story who is in Sweet Misery: A Poisoned World, and the Artificially Sweetened Times (www.idaho-observer.com). Her husband died from methanol poisoning from aspartame and she was convicted of poisoning him even after passing 3 lie detector tests, and was the one who called the police because she didn't know aspartame liberates free methyl alcohol. Also we are taking aspartame brain tumor cases in New York and New Jersey. Safe Alternatives: Stevia and Just Like Sugar (Whole Foods and Wild Arts). Letter to FDA: Why are you lying about aspartame? No evidence that sweetener causes cancer says the FDA in a recent communication sent out over the media wires. Betty Martini comments: "The news release that aspartame doesn't cause cancer would be laughable if it wasn't so sad that FDA simply will not tell the truth." On August 1, 1985 the FDA's own toxicologist, Dr. Adrian Gross, told Congress at least one of Searle's studies "has established beyond ANY REASONABLE DOUBT that aspartame is capable of inducing brain tumors in experimental animals and that this predisposition of it is of extremely high significance." ... In view of these indications that the cancer causing potential of aspartame is a matter that had been established WAY BEYOND ANY REASONABLE DOUBT, one can ask: What is the reason for the apparent refusal by the FDA to invoke for this food additive the so-called Delaney Amendment to the Food, Drug and Cosmetic Act? So what happened in between for the FDA to say aspartame is not a carcinogen? Perhaps someone sprinkled fairy dust and changed this deadly excitoneurotoxic carcinogenic drug into something entirely different. * "Failure to report to the FDA all internal tumors present in the experimental rats, e.g. polyps in the uterus, ovary neoplasms as well as other lesions." (Gross 1987a, page 8) FDA caught Searle red-handed filtering out neoplasms, excising tumors from rats, putting the rats back in the study and when they died resurrecting them on paper. But then what would you expect, as aspartame breaks down to a brain tumor agent, DKP. There were so many tumors found, more mammary tumors than brain tumors, thyroid, pancreatic and testicular tumors, ovarian and uterine, etc. The reason the FDA revoked the petition for approval was because of the brain tumor issue, and the fact it couldn't be proven safe. You will find the URL in this report to the current FDA Commissioner. * Then in 2005 the prestigious Ramazzini Study was released showing aspartame to be a multipotential carcinogen and confirming those original FDA studies. So the aspartame manufacturers with their government influence immediately began to try to rebut this study. It would have made a great movie, the things that went on. They would have been laughing in the aisles. 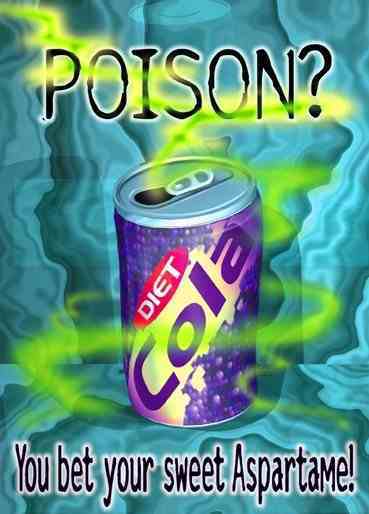 First they called a 10 year old multifood form a huge cancer study of aspartame with 1/2 million people. The multifood form was sent out by AARP asking elderly people if they remembered what they ate in the past 12 months. Frankly, I call it the Oatmeal-brownie study, although they asked if you remembered eating strawberries in season and if you had a hysterectomy. Of the 56 questions aspartame was only mentioned "once". In that question it was really asking if you drank coffee or tea, and if so what sweetener. Otherwise, it said to go to number 27 and answer whether you take vitamins. What this form didn't ask is if you were using any of the 6000 or more products containing aspartame. Here is the real report. * Now what to do? They had the European Food Safety Authority review the study, and they said the rats got cancer because they had respiratory disease. Well anyone knows that respiratory disease is the dying process. Dr. Soffritti wrote a press release on this "bizarre" statement. And everybody laughed but the EFSA did not apologize so I simply reported them to the Universal Court of Justice and some committee members links to Ajinomoto. Then one member on the committee confessed that industry pressured them to hi-jack science. They certainly owed Dr. Soffritti an apology but they simply hid their head and hoped it would blow over. The fiasco went on and on. There were even complaints that too much aspartame was used. * So, Dr. Soffritti simply did a new study using lower doses. Guess what, even in lower doses aspartame caused cancer, of course - after all, its a carcinogen! * Since Dr. Soffritti will be releasing this on Monday, the FDA decides to write this fable that aspartame does not cause cancer. Just forget their own records as mentioned above that say that it does, even by their own FDA toxicologist. Yep, they are just sprinkling fairy dust and trying to make the public believe these independent prestigious studies are fairy tales. But they won't get away with it because the world now knows. * In fact, if you want to see some of the brain tumor victims simply see the aspartame documentary on the poisoning of the world by this deadly poison - Sweet Misery: A Poisoned World, www.amazon.com or Barnes & Noble. * After all formaldehyde is known to cause cancer and the formaldehyde converted from the free methyl alcohol accumulates in the cells, damages DNA - and literally embalms living tissue: And the molecule of aspartame breaks down to diketopiperazine, a brain tumor agent. It just stands to reason that brain tumor agents will trigger brain tumors! "Formaldehyde has been implicated as a possible carcinogen when inhaled, but this hasn't been shown to be the case when its taken by mouth." Barbara Mullarkey says NutraSweet's excuse is there's never been a study. Can't you see it advertised: "Needed: applicants for double blind medical study, to drink formaldehyde to determine its carcinogenicity. Whether you drink alcohol or inject it; you'll get just as drunk. Whether you drink formaldehyde, inject or breath it, you'll get just as dead. By consuming low doses for years, constantly and continuously you just take longer to die, and you get to enjoy more misery: seizures, blindness, MS, migraines, perhaps diabetes, etc, but you'll finally be just as dead as if you drank a pint or so to begin with. It sure makes undertaker's work easier, less embalming, as one observed: "bodies come in with high contents of formaldehyde." It's a fine idea to test formaldehyde as a libation, and I've got the solution. (pun) Since the executives at Monsanto/NutraSweet are unconvinced as to the toxicity of embalming fluid as a drink, let's test it ... on THEM! Let's set up a study with Monsanto execs chug-a-lugging various concentrations for six months. Say, 5 shots a day, about the consumption by some DietCoke/Pepsi/Equal/Slimfast/Aspartame addicts. So we'll scientifically calibrate how much/long it takes to kill, blind or paralyze you. The matter will be settled. To get the ball rolling on this ground-breaking [really!] experiment I pledge a 55 gallon drum of formaldehyde. I'll also donate a $50 casket spray for the gold medalist in the competition. We could call it: THE NUTRAPOISON OLYMPICS. It's a little late, but we can ask the Olympic Committee to kick in for the coffins. And we can invite the IAT, The International Association of Terrorists, to the Games, advising them that bombs will be unnecessary because the whole thing will be a killer. Only problem, 4 years from now the winners won't be able to defend their titles, but can be honored by a moment of silence. which haven't been drink-tested: Rattlesnake venom, Arsenic, Hydrogen Cyanide, Plutonium, Essence of Black Widow, Nightshade, etc. Watch for Formaldehyde Olympics, part II. P.S. The Merck Manual says under formaldehyde: "This substance has been listed as a carcinogen by the EPA." And so years later, the FDA is still lying, just like the commissioner did to the New Mexico Legislators: http://www.thenhf.com/fda_87.htm Interestingly, the FDA attempted to have Searle indicted for fraud under Title 18, Section 1001, stumbling and lying . Unfortunately, both US Prosecutors hired on with the defense team and the statute of limitations expired. Now the FDA is just as guilty under Title 18, Section 1001. I bet they don't bring this poison home to their families. The manufacturers and the FDA, front groups, etc. continue to lie daily but its all a matter of public record: www.wnho.net/whopper. The FDA must be stopped from continuing to get away with lying, and such obvious deceit. At least publish my letter or the government records. Let the public have the facts, not fairy tales. This new study by Ramazzini is the death knell for aspartame which at one time was listed with the pentagon in an inventory of prospective biochemical warfare weapons submitted to Congress: http://www.wnho.net/the_ecologist_aspartame_report.htm This dreadful poison even triggers birth defects and mental retardation. Today 1 in 150 is born autistic. The term ADD and ADHD were not even used before the early l980's when aspartame was approved. It's an abortifacient and killing babies. Tell the public the truth!